I tried a 32bit adaptor without any luck. The 16bit one that I have only reads SD cards, not SDHC. But as you can see in the page, there is a note *The adapter supports HC (High Capacity) cards up to 1GB. So, can this one read memory cards SDHC up to at least 8gb?? I guess I got a bit lucky a few weeks ago when I found a MB genuine adapter on Ebay for 30 bucks shipped. Works like a charm. I got one as well from eBay. But not sure what memory card to put in it? I tried the regular sd it didn't work. Any advise?? For some reason, I have the same Sandisk adaptor, but 16gb SDHC wouldn't read, it reads the 2gb sd card perfectly, is there some type of update to the COMAND system to get these things working? I'm using 32GB SanDisk SDHC card car and it works fine. So far the card only has a few gigs worth of music, though. I don't even know which type we have in our car, type I, II or III? By looking at the slot it looks like we have type I.
I understand your question at the W221 forum but my understanding is that all W204 cars have an AUX or an iPod connector and don't need a workaround (at least not those that have the PCMCIA slot). There are many PCMCIA devices with different functionality, you cannot assume that those all work with the car and you obtain the feature the device was built for (say an Ethernet network card, a cell phone etc.). 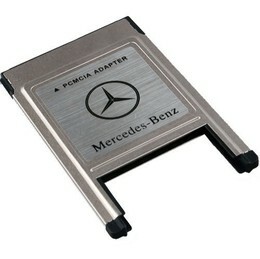 I have the original Mercedes PCMCIA adapter, which memory card can I use in it? I thought I could use the regular SD card but it won't fit, am I putting it wrong? Please Help! If I remember right, the original MB PCNCIA adapter only accepts CF, which I was told is being slowly phased out. I have found quite a few 'no name' brand PCMCIA -> CF Card adapters that work just fine. But what I have found is that CF Cards themselves are picky with my C350 COMAND system. The faster CF Cards often just don't get recognized, particularly the larger capacity. The best CF Cards I have found are the SanDisk Extreme 16GB and 32GB cards, which so far have worked great. Also there are some eBay resellers that sell 'knock off' Mercedes PCMCIA Memory card adapters, which are basically no-name PCMCIA->CF Card adapters that they have put a fake Mercedes logo. I guess if they work, it doesn't matter, but be warned. I have it all working fine for me, but with one issue. This is related to 32GB CF Cards in a C350. They are readable, but I use these to refresh content that changes weekly (Podcasts mainly) and I'm finding that the 16GB cards seem to work great with COMAND, but the 32GB cards are not telling COMAND to re-read the memory card each time. I can completely delete all content on the CF Card, and put new content on it, put it back in the COMAND system, and I get the old content showing in the Folder listing. Does anyone know if COMAND caches an index to the memory card, and if there is any way to force it to re-read the card and refresh its index? It may be a factor of the 32GB card being too big for it, which I suspect would have nothing to do with brand, etc. but simply that it can't re-index the content on media of that size. I bought both a 16GB and 32GB CF Card and the 16GB card DOES refresh each time content changes (or at least it did the last time I changed the content). I purchased a Compact flash adapter that fits nicely into the slot in my benz. Now i need to purchase a memory card to place in it. I want to fit an SD card into the adapter. Any suggestions on what product would work? My general experience with this is that using the Compact Flash media is touchy and not optimal. I bought a generic PCMCIA to CF adapter and got it working fine, but the CF media is touchy. Generally the SanDisk media is better, but it seems that the combination of PCMCIA to CF Adapter with the CF Media is hit & miss. Slower CF media seems to be more reliable, but even if you get it to work the larger the media the more likely that the media player won't recognize the entire folder structure on reading it. I found that a 16GB CF Media works well, but had some luck with 32GB as well although not as reliable over time. SanDisk branded media is generally the most reliable. 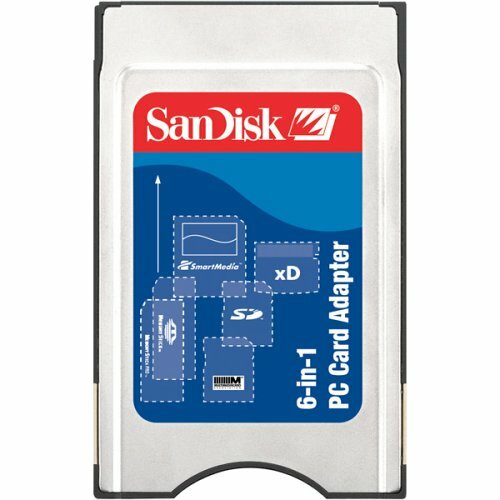 But I ended up throwing out the entire idea of using CF Cards in favor of a Chinese copy Mercedes branded PCMCIA to SDHC media adapter I got from eBay, and 16GB SanDisk SDHC media, and its been flawless. Fast & reliable. I did, however, try the same media with a locally sourced brand PC Card adapter and it won't work at all. Its a fickle thing trying to find a combination of adapter & media that works, and unfortunately CF media is not cheap compared with SDHC, so if you have to try a bunch of combinations to get the right one, it can be expensive. And then once you get the right combination, make sure you can repeat it if you need multiple copies of the media. Media speed matters, and this combined with the adapter card means the difference between a reliable and working solution, and something that either won't recognize the media at all, or will but won't give you reliability if you are updating its content regularly. 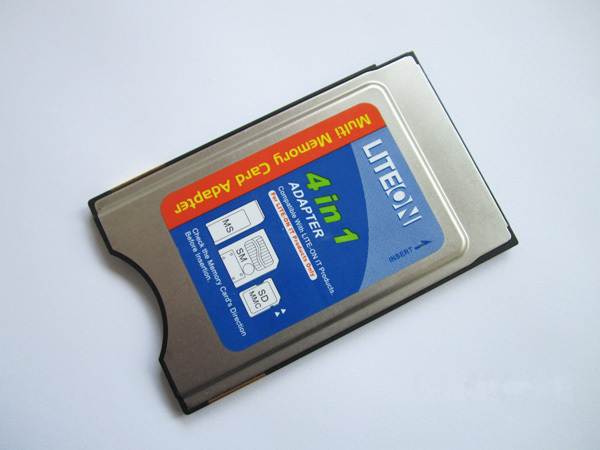 The LiteON 4 in 1 adaptor definitely doesn't work. I think I saw Fry's has SD-CF adapter the time I was shopping for the PCMCIA adapter. I don't want to have a two-stage adapter, ie, SD to CF then CF to PCMCIA. So I bought a refurbished San Disk 6-in-1 PCMCIA. It works perfectly with SD so far. I got this MB branded PCMCIA branded adapter from china a few months ago but for a SD card. I put in a 16GB Sandisk Extreme SDHC class 10 card and so far it is working great. Do you have the link or model number for the PQI memory? This is advertised on EBay in Australia.